Home About Us Programs Videos ¡BECOME A VOLUNTEER! HOW TO DONATE? Together for a wonderful double cause! Help kids in need and in a vulnerable situation to go to school while we help our planet. Donating 13 dollars you will be supplying a backpack made of recycling plastic bottlesfull of school supplies! Translation: 40 SOLES (13 dollars) = FUI 25 BOTELLAS PLÁSTICAS DE 2.5L (Each backpack is made with 25 plastic bottles of 2.5L). Let’s bring hundreds of smiles to the kids! Together let’s keep touching more hearts! Support us to keep touching more hearts together! You can make a deposit or transfer to the following account and if you have any questions do not hesitate to contact us. 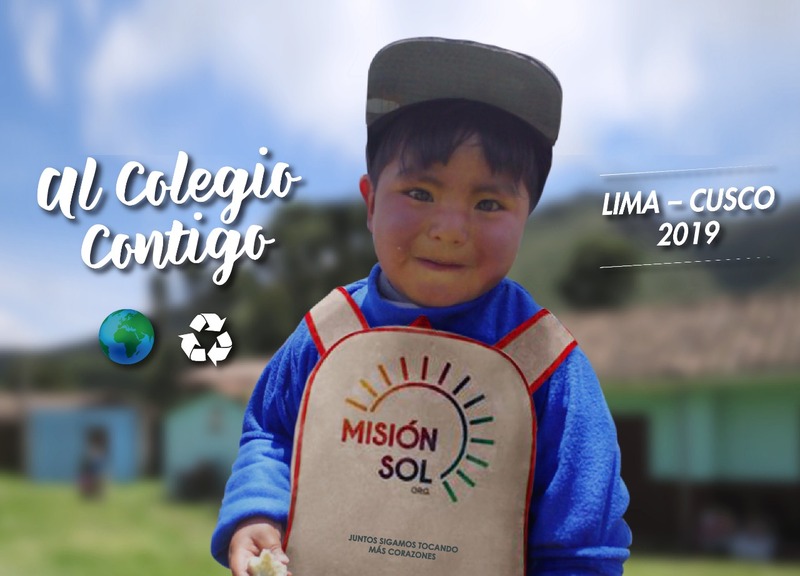 Approved as a recipient of donations by the National Superintendence of Tax Administration of Lima, SUNAT Republic of Peru, according to Resolution No. 0230050216322. © 2019 Misión Sol. All rights reserved. Santiago de Surco, Lima – Peru. Web design by Juanmi Romero.